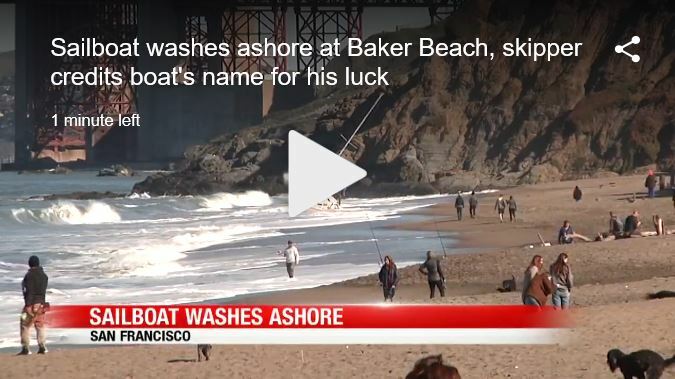 SAN FRANCISCO (KRON) -- There was no distress signal or mayday call when the skipper of this sailboat James LeBlanc lost control of the vessel before it washed ashore at Baker Beach in San Francisco. Was the situation dangerous for LeBlanc? He says yes. "Oh yeah! Most of the time. In fact I told the coast guard when they came out and I was anchored out there that I didn't even want help,” said LeBlanc. LeBlanc considers himself a bit of a daredevil. He says last Sunday he set sail from Sausalito for Monterey in a boat with an undersized sail. He says as he was clearing the Golden Gate Bridge, he ran into a few problems. "So I tried to leave a little bit earlier than I should have, was fighting the breakers right here, then at the last second when I saw that I wasn't going to make it, I had to just point for the beach,” LeBlanc. Making things more challenging was navigating his sailboat away from a massive container ships. "With just that little sail and if that container ship hadn't got in my way, I could have made it no problem,” he said. A member of the U.S. Coast Guard says the situation was unusual. "I would say this is on the unusual side. It is not every day that you get a sailing boat that washes up,” said Coast Guard Ensign Sarah Davis. The Coast Guard is working with the U.S. Park Police to get the vessel towed safely off the beach.